RELATED: What is Cloud Computing and What Does This Stupid Buzzword Mean? Traditionally, businesses and other organizations would host their own infrastructure. A business would have its own web server (or email server, or whatever) on its own hardware. If more power was needed, the business would have to purchase more server hardware. The business would also have to pay someone to administrate that hardware and pay for a solid Internet connection to serve its customers. Alternatively, there are hosting companies that host your services on some of their own hardware in their data centers, for a fee. Cloud computing works a bit differently. Rather than run your own hardware or pay for use of some specific hardware in someone else’s data center, you just pay for access to a massive pool of computing resources provided by Microsoft (or Amazon, or Google). This allows you to host web servers, email servers, databases, file storage servers, virtual machines, user directories, or anything else you might want. When you need more computing resources, you don’t have to purchase physical hardware. The “cloud” shares the hardware and automatically assigns the work, as necessary. You pay for as many computing resources as you need, and not a specific number of hardware servers on a rack somewhere. Services you deploy in this way can either be public servers available to everyone, or part of a “private cloud” that’s just used in an organization. There’s a much smaller up-front cost when using cloud computing. You don’t have to invest a bunch of money into creating your own data center, purchasing hardware for it, and paying a staff. There’s no risk of overpaying for too much hardware—or buying too little and not having what you need. Instead, you host whatever you need to host “in the cloud” provided by a service like Microsoft Azure. You pay for only the computing resources you use, as you use them. If you need more, it can instantly scale up to handle high demand. If you need less, you aren’t paying for more than you need. Everything from a company’s internal email system to public-facing websites and services for mobile apps are increasingly hosted on cloud platforms for this reason. What Can Microsoft Azure Do? 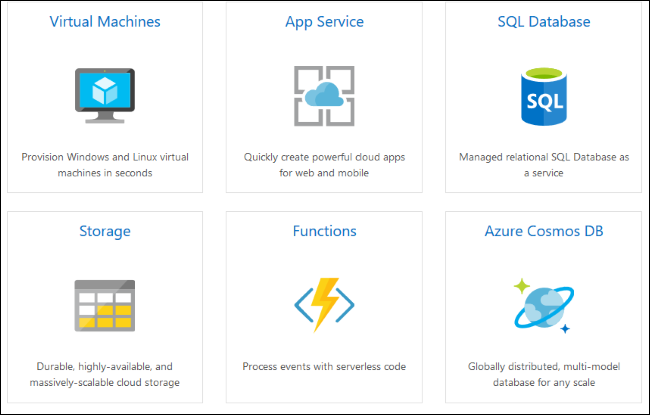 The Microsoft Azure website provides a directory of hundreds of different services you can use, including full virtual machines, databases, file storage, backups, and services for mobile and web apps. This service was originally named “Windows Azure”, but transitioned to “Microsoft Azure” because it can handle much more than just Windows. You can run either Windows or Linux virtual machines on Azure, for example—whichever you prefer. Digging through these hundreds of services, you’ll see that you can do practically anything. And for anything Azure doesn’t offer in an easy service, you can set up a Windows or Linux virtual machine that hosts whatever software you want to use. You could even host a Windows or Linux desktop in the cloud on a virtual machine and connect to it remotely. It’s just another way to use remote computing resources. Much of what Azure does isn’t exclusive to Azure. Amazon, Microsoft, and Google are competing. Amazon Web Services, for example, is the leader in the field—ahead of both Microsoft and Google offerings. Microsoft is also using Azure to extend Windows in some important ways. Traditionally, organizations that wanted to have a central user directory and management of their PCs needed to run their own Microsoft Active Directory server. Now, in addition to the traditional Active Directory software that can be installed on a Windows server, an organization can use Azure Active Directory. Azure AD is the same sort of thing—but hosted on Microsoft Azure. It allows organizations to have all those centralized administration features without requiring them to host their own Active Directory server (and set up the often complicated infrastructure and access permissions needed to make it work remotely). These services aren’t identical, but Microsoft is clearly betting that Azure AD is the future. Windows 10 users can join an Azure Active Directory via the “Work Access” feature, and Microsoft’s Office 365 service uses Azure Active Directory to authenticate users. Anyone can use Microsoft Azure. Just head to the Azure website and you’ll can sign up for a new account. Each account comes with $200 in credit that you can use over the first 30 days, so you’ll be able to get started and see how Azure works for you. You also get a certain number of free services for the first year, including access to Linux virtual machines, Windows virtual machines, file storage, databases, and bandwidth. Of course, all of this is really useful to people and organizations who want to host services or develop applications. If you’re just a Windows user—or a user of any other platform—you don’t need to use this stuff. But the developers who create and host your applications often use services like Azure. And if you own a company, you might be able to save some money (and some headaches) by letting Azure handle your infrastructure.